We are living in a world where “Islamists” are blamed for murder before the blood has even dried on the pavement. World outrage takes flight before the perpetrator is even apprehended. Yet we are censored and threatened if we dare to say boo to a Jew in jest or in protest at what is being done in their name. We live in a world where a Greek Orthodox Archbishop can be arrested by the IOF for peaceful protest. A world where a knesset member in the “only Democratic country in the middle east” can be threatened with the revoking of his citizenship for taking part in a Humanitarian relief project & [heaven forbid] exercising his “democratic” freedom of expression. We live in a world where, if our Governments have their way, we will be hamstrung, shackled, gagged and punished for speaking the truth. We already see BDS France enforcing the gagging order on Jacob Cohen for his association with Dieudonne, demonized by the French Government [the Israel possessed Valls] for daring to question and satirize the Jewish narratives that are the bedrock of Zionist impunity. Who the hell gave Judaism any superiority over other religions, faiths and beliefs that only they should be immune from investigation and exposure of wrongdoing? We live in a world where our rights, liberty and ability to protest inhumanity are being drained away while we worry about the next pay cheque. We live in a world of our making but we can unmake it and remodel it according to our blueprint..we are the change we are waiting for. Those who defend elitism, supremacy and oppression can go to hell! We only have to look at the centre of Hasbara and Zionist strategy, Israel [tho arguably it is the US], to see the appointment of Miri Regev as cultural minister as the symbol of their worldwide agenda to silence the intelligentsia and those intellectuals who raise their voices against Zionist inhumanity. Israel in their battle for supremacy and elitism have long feared the intelligentsia particularly among Palestinians renowned for their intellectual and cultural prowess. It is no haphazard mistake that Israel targeted entire families of Gaza’s doctors, engineers and guiding lights during the 2014 Operation Protective Edge. It is sad to see BDS as an organisation support this attack on many of our most effective and powerful voices by buying into the zero anti-semitism campaigns that only benefit Zionism. While BDS France ban the mild mannered Jewish intellectual Jacob Cohen, a Judeo Zionist nutcase, Gregory Chelli threatens to poison the director of independent French media site Panamza. Chelli who voted for the far right wing Naftali Bennett and who lives in Ashdod, is infuriated by Panamza’s legitimate investigation into his association with Zionist criminals and participation in their crimes against Humanity. His mafia style behaviour has never been condemned or even questioned by CRIF [Jewish Institution Federation France], religious leaders in France or by Manuel Valls, chief Zio puppet and official anti semitic “witch” hunter. 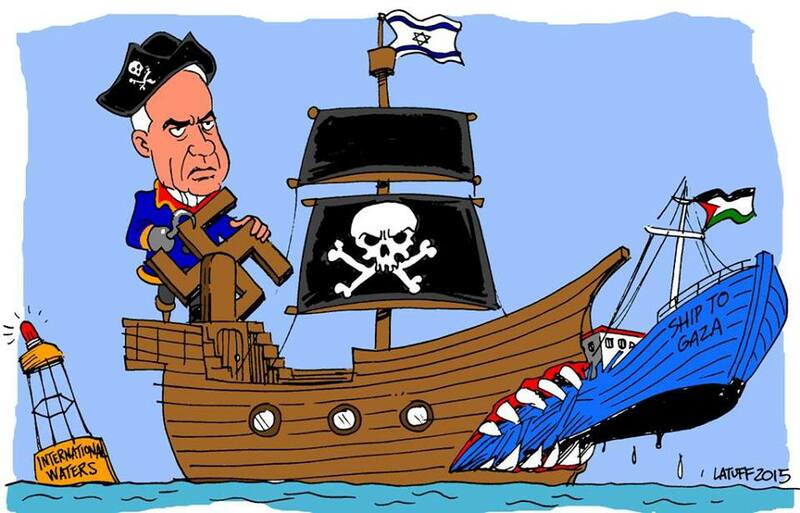 The participation of Dr Bassel Ghattas in the flotilla, caused an uproar in the Knesset earlier this week, with several MKs calling for his citizenship to be revoked, among them Culture Minister Miri Regev. The Knesset will discuss the matter on Tuesday. The barefaced arrogance of Israel in preparing this letter for the Gaza Flotilla that they knew from the offset, they were going to intercept with the full acquiescence of the International Community. There is no longer any pretence, Netanyahu and his minions are cocky little Caesars strutting their power games in the open. They dont care any more, their impunity has been confirmed so many times by the actions and inactions of our Governments, the UN, NATO. However we all know what happens to tyrants and above all what happened to Caesar. This while Israel is daily arming and treating the NATO ISIS terrorists in Israeli hospitals before returning them to massacre and maim in Syria at their behest. Weapons! Greek government employees thoroughly checked the boat’s cargo prior to departure. Once again Israeli propaganda creates a world based on lies, deceit and hypocrisy, the question is not when the International Community will react, that is a forlorn hope, the question is, when will Humanity wake up and destroy the vipers in their midst. June 29, 2015 in BDS, Israel, Palestine.